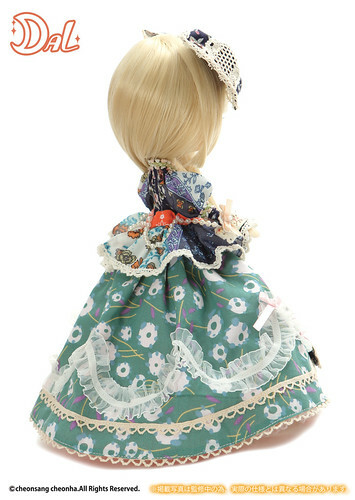 ← Optical Alice Pullip announced! 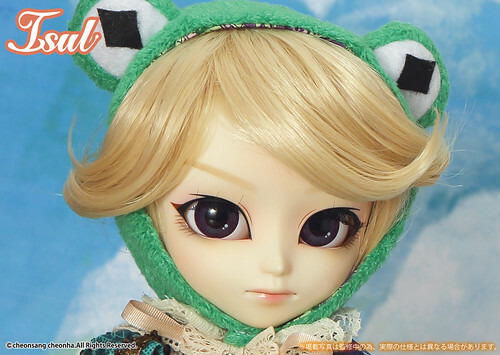 Frog Prince Isul Caros & Dal Dana Announced! 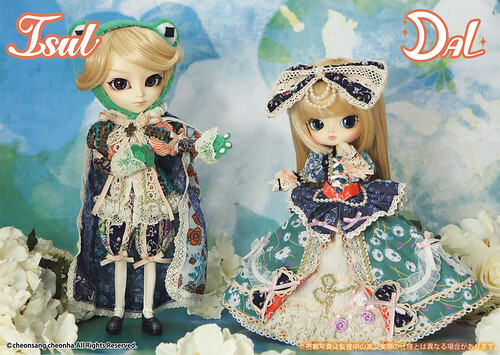 In addition to announcing Pullip Optical Alice, the debut release of a new series based on Alice in Wonderland Groove also announced two dolls based on the Grimm’s fairy tale The Frog Prince via their blog last night. Dal portrays Dana, the princess and Isul portrays Caros, the Frog Prince. The basic premise of The Frog Prince is that a spoiled princess makes the unlikely friend of a frog, she eventually kisses him or otherwise sparks a transformation (she throws him against a wall in disgust in the original, young love hehe) and the frog becomes a handsome prince. The prince had been turned into a frog by an evil fairy (or sorceress) and now that the curse has been broken, he and the princess can live happily ever after. Sound vaguely familiar? Disney made an underrated animated version of the Frog Prince back in 2009 the premise of the story had been changed up a bit ie. Tiana wasn’t a spoiled princess and she too becomes a frog. 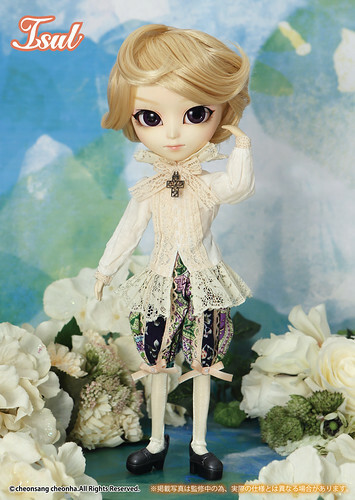 I like that Groove is branching out and doing more dolls based off of different fairy tales like Isul Hansel & Pullip Gretel that were released last year. 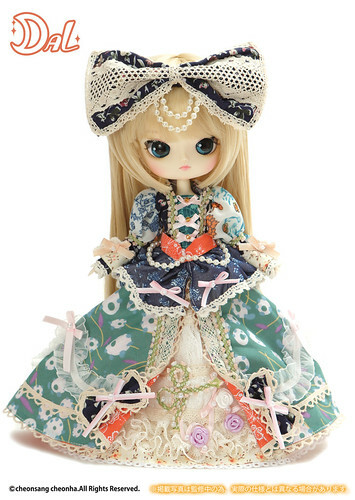 The characters are ones that most of us are familiar with since childhood so there is a certain sense of nostalgia seeing our favorite fairy tale characters come to life in doll form. Isul Caros and Dal Dana are to be released in January in Japan, they will be released here in the US one month later. 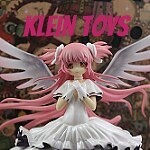 The dolls have a MSRP of 18000 yen each which is approximately $168.70 as of this writing. Isul Caros Ribbit, ribbit! I love that Isul’s outfit seems to be halfway in between his transformation while he is simultaneously both a frog and a prince. I’m kind of happy that Groove went this route, I would prefer this over a full frog suit (I already have a doll in a frog suit, my beloved Pullip Froggy) or completely ignoring the frog aspect of the frog prince which would have only raised questions about whether or not he is supposed to be the frog prince. I feel Groove found a happy medium for the character between prince and frog, so bravo Groove! 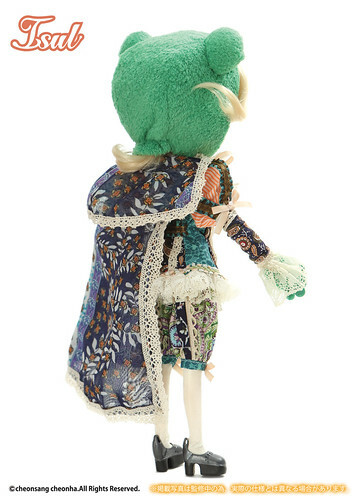 The frog aspect of the frog prince is represented by a frog hood and gloves, I must say the frog gloves are easily one of most absurd yet awesome stock pieces I have seen in years (currently tying for best with Chenille du Jardin’s caterpillar suit). I love the frog fingers, they are just such a great little added touch especially since Groove probably could have gotten away with just including the frog hood to represent the frog. The hood is pretty cute, I like the diamond shaped eyes. Caros’ more casual look is also really nice, I’m glad that Groove included a picture of it. I love the lacy shirt and how flowy it is. Back view of the outfit! I love the pattern on the fabric that is used for the cape. 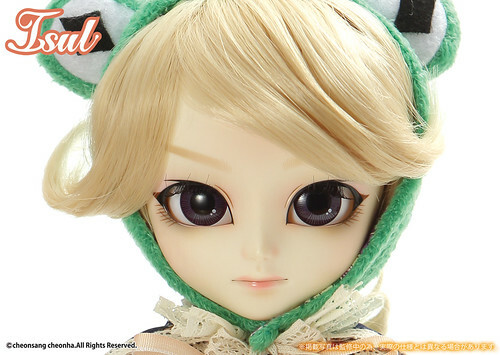 I like the blond wig but we’ve had quite a few blond Isul releases at this point, I think a more carrot red color would have really made the colors of his stock pop that much more. Coros has a nice face up! The most notable feature to me is Coros’ lips they are noticeably deemphasized. The way they are painted makes them look a bit thin but frogs have really thin lips so it is fitting. The colors of the lips is a really nice muted pink. His eye makeup is kind of interesting too, the eyeliner on his upper eye is black ending in a bit of a point by the tear duct the makeup on his lower eye is mostly brown. The “wing” on his eye makeup in the outer v has a brown tip, I’m not sure how fond I am of it I think I would have preferred it if it was all black versus mostly black with a brown tip. The eyechips are kind of unremarkable. 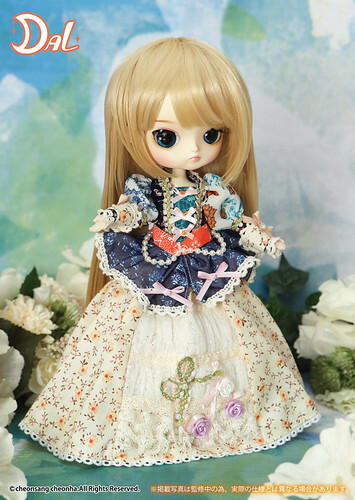 Dal Dana makes such a pretty little princess!Her dress is a mix of contrasting patterned fabrics, despite the very different colors/patterns they are not discoordinate they work together rather nicely. Most of the colors are somewhat muted but it makes me really like the little pops of bright colors such as the little bits of orange fabric at the hem of the dress and at the waist. The way the outer shell of the skirt is opened in the front almost makes it feel like a frame for the inner skirt highlighting all the lace with the flowers/vines interweaved into it. The bows are a recurring theme throughout her dress they provide a nice little touch. The dress without the outer shell, I actually prefer the dress with the outer shell on. I feel like the colors work together more cohesively with the outer shell on, the bottom of the dress seems to almost be too light in comparison with the top making it look a bit unbalanced. Back view of the dress, I love the way the lace is scalloped it’s an interesting little visual detail that keeps the skirt from looking too plain and the somewhat loud print from overpowering it. Such a darling little face! 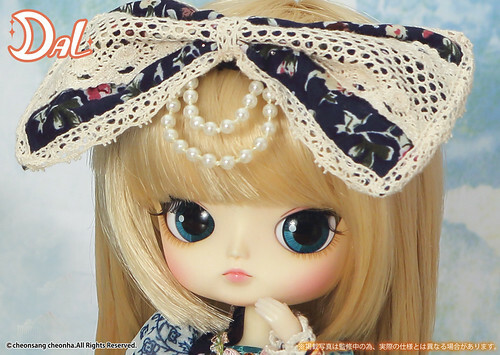 The bow/headdress is nice especially with the dangling pearl elements. She almost looks too sweet and innocent to be the spoiled princess. Dal Dana has a gorgeous face up! She has lots of pink blush and her lips are like darling little rosebuds, they are very pale pink. Her face up looks so sweet and delicate. Her eye makeup seems to be done in shades of brown which really complements the pink of the blush/lips nicely I feel like black would have been too harsh a color. I really kind of like the two-tone blue eyechips that were chose for her. 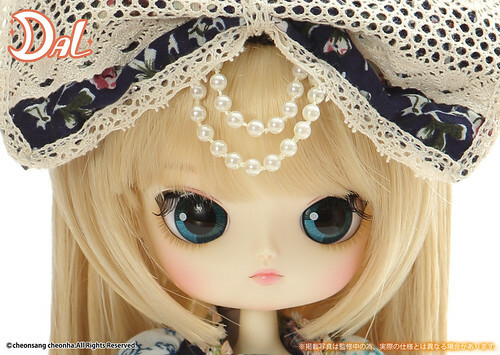 Verdict: I quite like this pair and hope to get them eventually but I feel like getting Pullip Optical Alice is going to be my top priority for this month! This entry was posted in Dal, Doll, isul and tagged 2017 dal, 2017 groove, 2017 isul, asian fashion doll, Dal, dal dana, fashion doll, groove, isul, isul caros. Bookmark the permalink.